Meditation has often been dismissed as silly or considered something only monks do. Below you will learn how it now only increases your focus and attention, it actually changes the makeup of your brain! As a poker player, who wouldn't want that?! Have you ever found your mind wandering during a long poker session? Is your level of attention as high as you want it to be when you are doing hand reviews and watching training videos? Do you experience unwanted emotions in the form of tilt? Do you suffer from (or have you ever suffered from) ADHD, depression and/or anxiety? If your answer is yes to any of these questions, then this is the article for you. A new stress management technique has emerged called mindfulness meditation that can be very advantageous for poker players to learn about and utilize in order to deal with all of these issues and more. Generally speaking, mindfulness meditation is a meditative technique that emphasizes an observant yet nonreactive stance towards one’s thoughts, feelings, and physiological responses. Experts in the field have defined mindfulness meditation as a cognitive and intention-based process characterized by self-regulation of attention to the present moment with an open and accepting orientation to one’s experiences. What this means in laymen’s terms is that you focus on an anchor — usually it’s your breathing — and whenever random unwanted thoughts come into your mind, you simply dismiss them and refocus. It’s a fairly simple process, but it offers some astounding benefits. Recent studies have found that mindfulness meditation acts as a powerful mental training tool that can be used to regulate brain function and attention. In fact, clinical studies have determined mindfulness meditation can change neural activity, alter neurotransmitter levels (especially dopamine), and increase cortical thickness. What’s so impressive about these findings is that mindfulness meditation actually changes the physical structure of the brain so that it operates in a more efficient and less emotional manner. For example, increased cortical thickness is associated with higher levels of self-control and less emotional instability. These changes occur in a very short amount of time and with continued meditation practice can be quite powerful. This is very good news for players who suffer from tilt problems. If you also experience (or have experienced) ADHD, anxiety, or depression, this research is even more encouraging. While medication is usually the best line of defense for the aforementioned disorders, many people don’t respond (or only partially respond) to medication, and even those who do can still benefit from additional treatment modalities like mindfulness meditation. Mindfulness meditation may not negate the need for medication — always check with your physician with medication questions or concerns — but it has the capability to greatly reduce symptoms and has no known bad side effects. Sit down and get comfortable. Focus on an “attentional” anchor. Most people focus on their breathing by saying the number “one” to themselves as they breathe in and the number “two” as they exhale. Make sure that you are breathing deeply enough to push out your diaphragm — inhale and exhale slowly and deeply. When your mind begins to wander, as it surely will, notice your thoughts, but then refocus on your breathing as quickly as you can. Make a goal to engage in this practice every day for at least 5 minutes. Twice a day is even better. Work up to meditating for longer periods as you get more accustomed to the process. The great thing about mindfulness meditation is that you can practice it while sitting quietly, walking slowly, or even when engaging in everyday activities like washing the dishes. Try to “pay attention to your attention” by staying in the moment as you go through your daily routines. Does your mind wander while you are engaged in mundane activities? Then this is the ideal time to practice being mindful. Really keep your focus and attention on what you are doing. 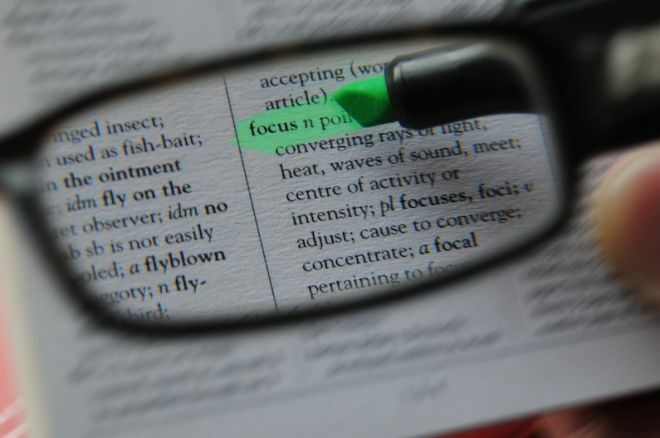 The more you practice focusing, the better you’ll get at it. If you decide to practice mindfulness meditation on a regular basis, you might just find that tilt ceases to be a problem for you. Your attention and focus may improve and you may discover it easier to play your “A” game for longer periods of time. Give it a try and see what you think! Photo “Focus,” Mark Hunter. Creative Commons Attribution 2.0 Generic.